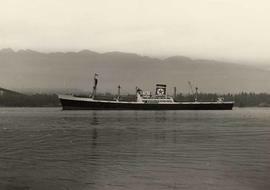 Photograph depicts "Canadian Star", part of the Blue Star Line fleet.Freighter with black hull in middle of image; star in a circle painted on smokestack of ship; North Shore mountains and beginning of bridge in background. Photograph depicts a ship at sea.Ship with white hull, bow facing left; two lifeboats on upper deck; mountains in background. 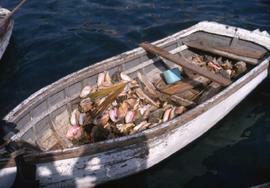 Colour Kodachrome 35mm slide depicts a boat filled with conch shells. Colour Kodachrome 35mm slide depicts a boat filled with people with buildings in the background. Colour Kodachrome 35mm slide depicts a boat going through the Panama Canal taken from another ship in the foreground. Photograph depicts a motorboat in Burrard Inlet.Bow end of motorboat in centre of image; men in suits visible in cabin of boat, young man leaning over guard rail of starboard side of boat; Port of Vancouver and Second Narrows Bridge in background. Photograph depicts a boat on the water at sunset.Right of image framed by tree; small vessel on water in foreground; mountains and sunset in background. Colour Kodachrome 35mm slide depicts a boat with people sitting and standing inside with four signs in Thai on the roof. One of the sign is a "Coke" emblem in Thai. Colour Kodachrome 35mm slide depicts two rowboats on the Sea of Galilee.